Birding in the Elgin area, some wine tasting and a talk on the next Bird of the Year have been organised for August. The monthly morning outing will be to Jessie Walton’s farm near Elgin on Thursday 7th August. We depart from Onrust Trading Post at 08:00. The outing will include a visit to Iona, where we will help them create a bird list and taste their wine (optional). Bring some mid-morning refreshments. The highlight of our monthly evening meeting on Wednesday 20th August will be a talk by Wicus Leeuwner on the Blue Crane, Birdlife South Africa’s Bird of the Year for 2015. The meeting starts at 19:00 and will end with tea, coffee and biscuits. Birds seem to favour red and black fruits according to an investigation published in Scientific Reports. These are the most common colours of fruits that are chiefly dispersed by birds; thus, the observations suggest that fruit colours have evolved, to some extent, to attract birds. Club members have been asked to help with research on fynbos birds which may contribute to conserving these precious birds. Anina Heystek of the University of Stellenbosch appealed to members at the monthly meeting on Wednesday 16 July to supply information on the birds, plants and bird feeders they have in their gardens, by completing a questionnaire that would take about 20 minutes. Hope we will see a great turnout tomorrow night for our Quiz – quizmaster Ronnie Hazell will put us through our paces. Starts at Fernkloof Hall at 19h00 sharp – July 16th. There is space for one couple left on this outing in October – if you wish to participate contact Craig on pcsholmes@telkomsa.net. Duinepos – here we come again!! We have arranged another outing to Duinepos – one of the HBC’s favourite spots in the West Coast National Park. The accommodation is as usual in a two bedroom unit with bathroom and a lounge/dining room/kitchen. The accommodation is very comfortable. The cost is R795.00 per person – so if you stay for the 5 nights its R159.00 per person per night!! As usual the HBC will arrange the daily activities for the first three days and we will set up the braai each of the first three evenings. The additional evenings will be played by ear by those staying longer. We will be creating teams for the evening meals and the teams will create a starter, salad/potatoes and a dessert for the first three evenings. The teams will be advised later. We will all have to bring our own meat to braai in the evenings as well as we will each do our own breakfast and make our lown lunches. Naturally you will have to bruing along your own refreshments!! Space is available on a first come first served basis. Upon confirmation we would require a 50% deposit and the balance by 15 September. If you book and cancel we will do what we can to get someone to fill your space – if we can’t and cancellation fees apply we will do what we can to arrange a refund but we cannot guarantee that we will succeed. Want to come along – contact Craig on pcsholmes@telkomsa.net right away. Our next outing is to be from Oct 12 to 15 with free extra two nights available. Full details are being mailed today. The cost is R795 pp and is on a first come first served basis. In the face of predicted gale-force winds, heavy rains and even snow, a group of 18 club members experienced a lovely, sunny Thursday morning birding in Stanford. A walk on the bank of the Klein River and a visit to the hide at the local dam produced a count of 45 birds, including a Giant Kingfisher, Purple Heron, African Goshawk, African Swamphen and Black Crake. 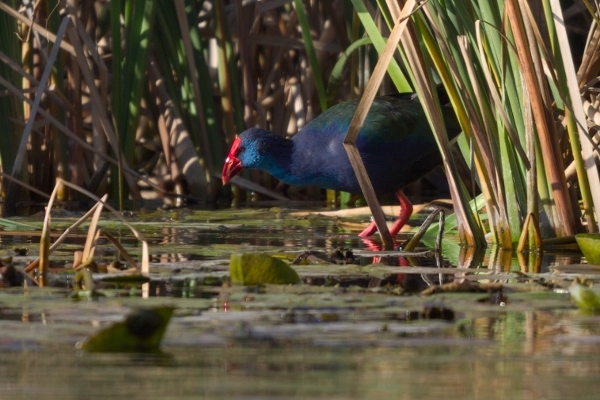 African Swamphen at Stanford dam. The breaching of the Klein River lagoon last weekend apparently caused the death of a number of Red-knobbed Coots. At least eight dead coots and a cormorant were spotted on Grotto beach this week after the lagoon had breached last Friday late afternoon. They seem to have been washed out onto the beach with reeds and other debris from the lagoon. Club expert Mike Ford said a large number of coots were swept out to sea by the force of the water when the lagoon breached on a previous occasion. Some were rescued but about a hundred drowned then. 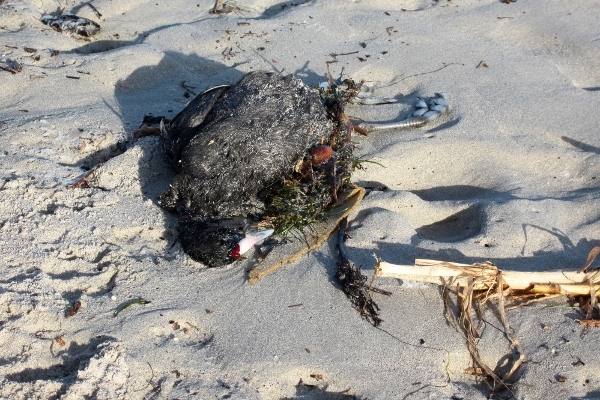 Drowned Red-knobbed Coot on Grotto beach.